DONETSK, Ukraine -- Ukraine is close to war, the German foreign minister, Frank-Walter Steinmeier, has warned in interviews published in four European newspapers on Tuesday. A burnt-out car parked on a road near Semyonovka village, near Slavyansk. Dozens are feared to have died in clashes outside Slavyansk on Monday as Ukrainian troops clashed with pro-Russia separatists. "The bloody pictures from Odessa have shown us that we are just a few steps away from a military confrontation," Steinmeier told El País, Le Monde, La Repubblica and Gazeta Wyborcza. He added that the conflict had taken on an intensity "that a short time ago we would not have considered possible". The acting Ukrainian interior minister, Arsen Avakov, claimed that more than 30 pro-Russia separatists had been killed in fighting outside the key rebel town on Monday. "We estimate that the terrorists lost more than 30 people," Avakov wrote on his Facebook page. The Guardian was unable to confirm the figure. According to officials, four Ukrainian soldiers have been killed and at least 30 injured in clashes with separatists as the army attempted to regain control of eastern Ukraine. 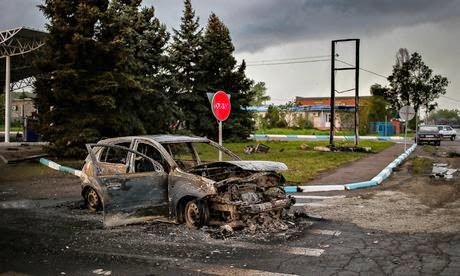 The fighting on the outskirts of Slavyansk, the base of the armed movement that has taken over a number of cities, was triggered when pro-Russia rebels reportedly ambushed Ukrainian forces. The separatists reported deaths in the fighting but could not confirm the number of fatalities. A military helicopter was shot down although both pilots survived, according to the defence ministry. On Tuesday morning, Donetsk airport was closed for departing and arriving flights because of a government order. Ukraine's government gave no information about the closure, and the airport spokeswoman said she had not received any information about how long the closure would last. As well as the clashes in the east, the fallout from the violence and fatal fire late last week in the southern city of Odessa continued to be felt on Monday. Under a leaden sky at the edge of a cemetery in Odessa, family and friends laid to rest Vladimir Markin, a local politician who was killed in the vicious street battles that convulsed the city last week. A short distance away, the funeral of another man who died fighting pro-Ukrainian crowds was also taking place. The burials were the first of dozens over the next few weeks as the port city struggles to come to terms with Ukraine's most violent day since the new regime swept to power in February. Markin, 44, was a key supporter of a semi-permanent protest camp in Odessa against the current Kiev government that was burned to the ground on Friday before fighting moved to the nearby trade union building. At some point during the melee he was badly beaten and died in intensive care in a local hospital the following day. The other funeral was of Maksim Nikitenko, 31, who was also killed early on during the struggle inside the trade union building. "They fought and cracked open his skull and then he was thrown out of the window," said Petya, a friend. Nikitenko was not a separatist or an extremist, but he ran to defend the building when he heard it was under attack, Petya added. Before the burials, Markin's open casket lay in the local parliament building for friends, colleagues and residents of Odessa to pay their last respects. Outside, an angry crowd gathered and the regional governor, who had come to lay flowers, was assaulted and forced to flee ignominiously down a corridor. When pallbearers carried the coffin out of the building people clapped and chanted: "Odessa is a Russian city," "Hero, hero, hero!" and "Odessa will not forgive nor forget." The Ukrainian interior ministry said on Monday morning that 42 people detained during the violence had been transferred to other parts of the country. The move came after an angry mob forced police to release more than 60 detainees on Sunday. Avakov said a special forces battalion had been transferred to the city to help maintain order. The Ukrainian government has said the violence was initiated by Russian provocateurs, while Russia has referred to the deaths – many of which were caused by a fire that broke out inside the building – as a massacre inspired by "neo-Nazis". The horrific events have worsened an already tense situation. Supporters of closer ties with Russia, who made up the majority of the mourners, blame the government in Kiev – which they describe as a junta and illegitimate, mirroring Russian state propaganda about the Ukrainian authorities – for the deaths last week. They accuse the police of failing to act swiftly enough to stop the violence. Ukraine has accused Russia of directing the separatists, providing weapons and using proxy figures on the ground. Most analysts think Russia does not want a Crimea-style annexation of eastern Ukraine, but merely to stir up discontent and disrupt elections at the end of May. In recent days, Russia's president, Vladimir Putin, has made no public statements about the situation, but the Russian foreign ministry again pinned the blame on Kiev in a statement on Monday evening. "The so-called authorities in Kiev continue to wage war against the people of their own country," said the ministry, adding there was a humanitarian catastrophe brewing in the east of the country and calling on Kiev to stop the bloodshed. Ukrainian authorities have likewise repeatedly called on Russia to stop stirring unrest in the region, as accusations continue to fly between the two countries. Germany said on Monday it was pushing for fresh diplomatic talks in Geneva between Russia, Ukraine, the EU and US, to push for a return to the accord reached last month that encouraged all sides to put down their weapons. Steinmeier said new talks were needed to reach a "clear conclusion as to how this conflict can be brought to a halt". In eastern Ukraine, surveys show the vast majority of people want more autonomy from Kiev but only a minority want to join Russia. However, the mood has turned nastier in the last week, with crowds burning Ukrainian flags and many speaking about a "point of no return". In Odessa, 52-year-old Igor Bulatov, an engineer who attended the funerals, said that while there were few separatists among current pro-Russia protesters, the deaths last week might change that. "I came to pay my respects to people who were murdered … when you kill people for their ideas it is fascism," he said. "Recent events mean a lot of people are now wondering about what country they want to live in. There is an atmosphere of shock. It is a moment of self-definition: people have to decide who they are and what they want."